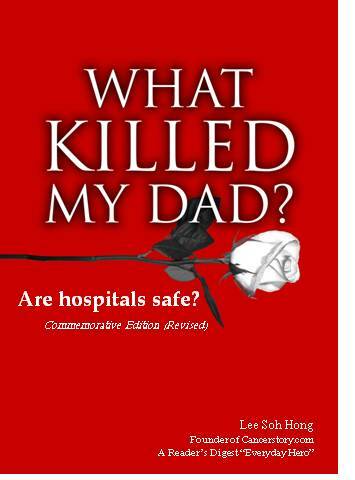 In memory of my dad, I wrote this book to share the impact of hospital-acquired infections (HAIs) on patients and their families, and raise awareness of patient safety among the general public. I hope that our healthcare policymakers, hospital administrators and healthcare workers will make a concerted effort to improve practices and compliance with infection prevention and control strategies, and make patient safety their top priority. Monday's report ("Superbugs - why they matter to Singapore") reminds us about the hidden toll of drug-resistant superbugs. Infections caused by superbugs are difficult and expensive to treat. Deaths caused by these bugs don't seem to be adequately tracked and are not often identified as a cause of death. Many patients contract superbugs in hospital settings, but there is no clear understanding of where a particular superbug is causing an outbreak or where infections are increasing or decreasing. Thus, the public does not view the emergence of superbugs as a pressing health issue. To contain healthcare costs and improve patient safety, I hope the Ministry of Health and the medical community will urgently stamp out superbugs and conduct public education on this threat.